The US is "on the right path" and has accomplished much under Barack Obama, outgoing Secretary of State John Kerry told reporters, defending the departing president’s legacy from the Iran nuclear deal and climate change to Syria. “Under President Obama’s leadership, we have secured significant achievements that have made our country safer and improved the lives of millions of people around the world,” Kerry wrote in a memo to the White House published on Thursday, and echoed the remarks at the State Department later. The State Department “worked overtime to assemble a 68-nation coalition that has come together from across the globe to take on a genocidal enemy waging war against civilization itself,” Kerry said about the US efforts against Islamic State (IS, formerly ISIS/ISIL). “We are on the right path, both diplomatically and militarily, and we need to stay on that course,” he added. As proof that the US continues to lead, Kerry pointed out that Washington was not absent from the Syrian peace process. “We’re not competing with – we back the efforts of Russia, Turkey and Iran” in Astana to negotiate a ceasefire in Syria, he said, adding that the US hoped this would be a step towards formal peace talks. The Astana talks were based on the parameters the US established through the International Syria Support Group (ISSG), Kerry said. In the memo, the secretary of state claimed the US “led the world to come together to remove and destroy Syria’s declared stockpile of chemical weapons” in 2013, repeating the unproven claim that the Syrian “regime” used chemical weapons on that occasion. The US “stopped Ebola in its tracks,”helped negotiate peace in Colombia, began lifting the blockade of Cuba, and made progress in fighting the “phony caliphate”of IS, Kerry told reporters. He also brought up the deal reached with Iran to limit nuclear enrichment and bringing China on board the Paris Agreement to combat climate change. “Obviously, we haven’t solved every problem,” the departing secretary of state said, but defended his record as one of great success in restoring US prestige in the world. Asked about the metric for that conclusion, Kerry said that the entire world looked to US for leadership. “Listen to people in the world, not some country that has a gripe about one particular policy or another,” he told reporters. Asked about President Barack Obama’s famous “red line” proclamation, Kerry told reporters that Russian Foreign Minister Sergey Lavrov offered to help with chemical weapons roundup while Obama was waiting for congressional approval for airstrikes in Syria. He did acknowledge that Washington planned to oust Bashar Assad’s government by supporting the rebels, but “that whole ball game changed” when Russia intervened in September 2015. 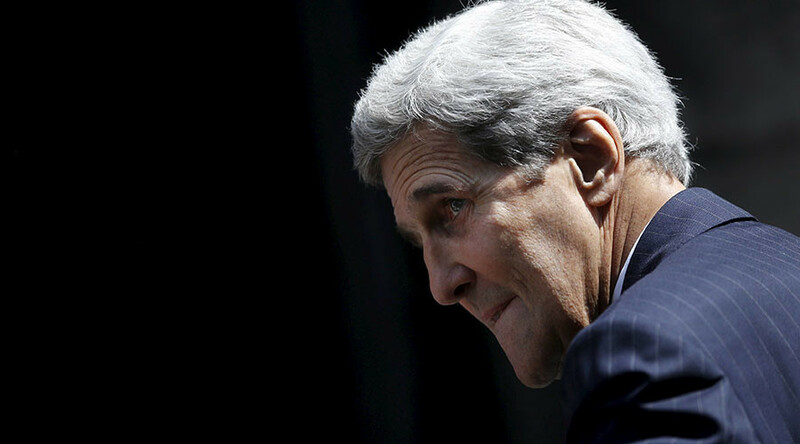 “You don’t know and I can’t say,” Kerry told a reporter who asked whether the sanctions imposed by President Obama at the end of December were a sufficient response in light of the seriousness of the charges.